Former Pompey youngster Theo Widdrington put Jack Pearce’s men ahead on 41 minutes before Frenchman Richard Gilot doubled the lead five minutes into the second half. Ryan Pennery scored twice as Gosport gained a vital win at home to Frome in the Southern League premier south division, where they are battling to get out of the drop zone. 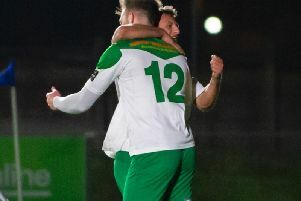 He netted in the 65th and 70th minutes to put Borough in charge, and Pat Suraci made sure of the win with a third in the 78th minute. Josh-Morgan Williams grabbed a consolation for the Somerset visitors. Moneyfields slipped down a place to third in the Southern League division one south after a 1-0 reverse at Paulton. Sammy Jordan got the hosts’ only goal late on.